While most of us are aware of what is a balanced diet, our knowledge is often superficial – although we know about the role and importance of each nutrient we are not that well-versed about how much of each nutrient to include in our daily diet. Protein is one such nutrient that we usually take for granted, assuming that it will automatically come from one or the other ingredients we consume! However, we need to understand that not only do we need proteins throughout our life, we also need it in varying quantities, depending on the stage we are in. The special requirements of proteins at different stages of our life, depend upon its functions during every age, may it be childhood, old age, or pregnancy. Proteins are critical for a variety of tasks, right from the formation of new cells, strong bones, hemoglobin, to managing the wear-and-tear of body cells, etc. While it is generally acknowledged that non-vegetarian foods are the richest sources of proteins, there is no reason for vegetarians to worry, as there are a number of vegetarian foods such as milk and milk products, pulses, nuts, sprouts, soya and its products, a few veggies that are rich in protein etc. All we need to do is combine them in the right ways. 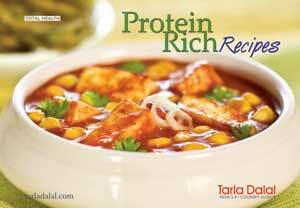 This book includes 46 well-planned recipes that combine almost all the vegetarian sources of protein – and all the recipes provide above approximately 4 to 5 gm of protein per serving. What is more, the ingredients are combined in such a way that the synergy between them improves the protein quality. Make these innovative recipes, and include them in your daily meals to get all the proteins you require! Stay fit at every stage right from childhood, and sally forth with panache even as you age – remember, protein is your best friend!